You work in the laboratory at your local NHS hospital, and today you're on the Saturday-night shift - starting work at 6pm. Your first task is to test the blood of a critically ill patient in need of a transfusion, and you work with the latest high-tech medical equipment to determine the correct blood type as fast as possible. As you specialise in transfusion science, the rest of your shift is spent testing the blood types of patients requiring transfusions, and preparing the donated blood they'll be given. You enjoy providing doctors and surgeons with vital information and materials - and knowing that every day you help to save lives. You're responsible, mature and are an effective communicator of complex results to a variety of clinical staff. You enjoy science, working in laboratories and are able to concentrate on the detailed tasks involved in testing patient samples. You'll usually need a minimum of five 9-4 (A*-C) grade GCSEs (or the equivalent), including maths, English and science. Then, you'll be all set to apply for three A levels (or the equivalent) at college. You'll usually need three A levels preferably including chemistry and biology. Then you can begin an approved healthcare science degree in life sciences or in biomedical science at university. Some universities accept alternative level 3 qualifications to A levels, so it's vital to check the requirements of individual institutions well in advance. 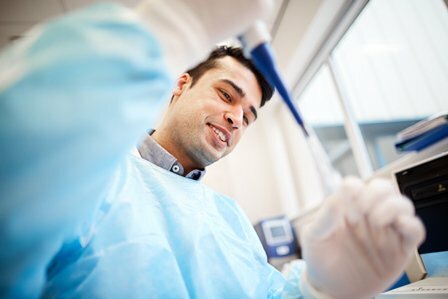 Healthcare science practitioner degree apprenticeships where you could specialise in blood sciences, cell sciences, infection sciences or genomics may be available in some parts of the country and you'll usually need the same level of GCSEs and A levels or equivalent qualifications. Always check the exact requirements with the employer as like universities, they can vary.